FLATOUT Flatbreads were created by a husband and wife team with a little restaurant and a big passion for delicious food, especially bread. They made their own flatbreads to serve their customers, and now they're bringing FLATOUT Flatbreads to you so you can use your creativity to make fabulous wraps, sandwiches, pizzas, roll-ups, and more in your own kitchen. Made with 100% stone ground whole wheat. 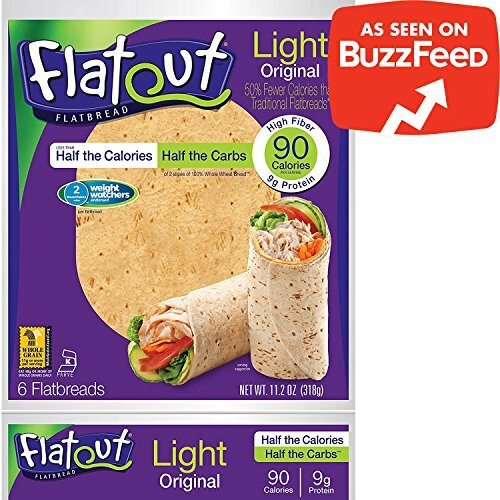 33% less calories than original Flatout. If you have any questions about this product by Flatout, contact us by completing and submitting the form below. If you are looking for a specif part number, please include it with your message. Back to Nature Crispy Wheat Cracker, 8 Ounce - 6 per case.